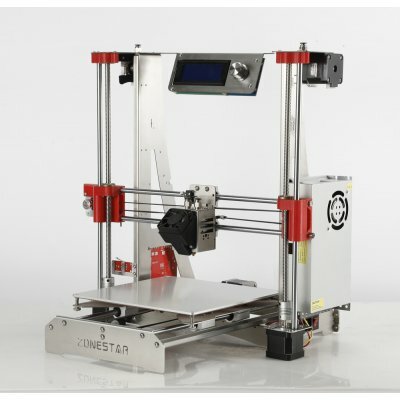 Successfully Added Zonestar P802QR2 3D Printer Kit - Highly Accurate, Smooth Stainless Steel Platform, Dual Extruders, Large Printing Volume to your Shopping Cart. If you’ve always dreamt of entering the world of 3D printing, the Zonestar P802QR2 3D Printer is the gadget that you’ve been waiting for. This cheap DIY 3D printer can be easily built-up and used by anybody out there. Once assembled, it allows you to print anything your mind can imagine. Simply insert your file, press print, and your 3D printer will do its job. With its simple design and large LCD display, this 3D printer kit is easy to operate. It features printing speeds up to 150mm/s and a large printing volume of 220x220x240mm. This makes your 3D printer perfect for printing larger sized objects. By supporting a wide range of filaments, this gadget is great for any type of artist, hobbyist, teacher, and 3D printing enthusiast. The Zonestar P802QR2 3D printer comes with smooth stainless steel parts for extra stability. It features an extremely high accuracy to make sure all your printing projects look absolutely stunning. Thanks to its dual extruders, this DIY 3D printer can print multiple colors and different filaments at once. This will significantly increase your artistic capabilities while working on your upcoming art projects. Whether you’re a teacher, artist, engineer, or beginning 3D enthusiast - this cheap and simple to use 3D printer is sure to meet your demands. This 3D printer comes with a 12 months warranty, brought to you by the leader in electronic devices as well as wholesale 3D printers..